Last week, CNN’s Christiane Amanpour invited RT’s Anissa Naouai to discuss what the US channel called ‘a heated propaganda war’ by the Russian government. But it never showed viewers Naouai’s criticism of Amanpour's own propaganda exercises. Naouai, host of RT’sIn The Now, was invited to speak along with Mikhail Kasyanov, a former Russian prime minister and a fierce critic of President Vladimir Putin’s policies. RT offers a complete video of Naouai's answers, as well as the full transcript of the discussion below. MIKHAIL KASYANOV: That's a deep problem of the policy. The problem of Mr. Putin, because Mr. Putin believes that such a policy he pursues internally and externally, that's normality in 21st century, which is absolutely not. And therefore he is sometimes even angry on the Western society, why the Western society doesn't accept his regime as normal one. Therefore that's a problem of mentality rather than of image. AMANPOUR: Anissa, let me ask you, do you feel that "Russia Today" and other state-sponsored media is specifically designed to counter what your government, your president believes is a bad image problem, an unfair shake in the West? ANISSA NAOUAI: Just to be clear he's not my president. I'm an American. He's the Russian president. And "Russia Today" airs to a global audience. So it's not really watched in Russia; it's in English; many people across Russia don't really turn to Russia Today to get their news. And I certainly don't represent the Russian media as a whole. I represent RT and more so myself. But I think specifically about RT – because it's been in the media quite a lot recently to focus on that – I think the thing about RT which is misunderstood by a lot of people, not our viewers, because they know very well, is that we have nothing to hide. People know where our funding comes from. We're "Russia Today." We're funded by the Kremlin, despite the sort of addressing by foreign media that it's some kind of revelation of investigative journalists. Our budget is completely open. It's completely transparent, even though it's misquoted very often. And so it's interesting to us that these kind of questions are asked by the mainstream media, by a channel like CNN, who has journalists that have left the channel because documentaries on Bahrain haven't been run like "I-Revolution" a couple of years ago, which air programs like "Eye on Georgia," "Eye on Kazakhstan," "Eye on Lebanon," which are essentially government-sponsored programs. And that's barely, very, very secretly disclosed to the audience. You really have to go on the site and dig for it to find that these are not sort of just basic, unbiased reporting on the ground. These are government sponsored programs aired on television. So it's interesting to have questions asked of us, staff at "RT," how do we feel about kind of representing the Russian government. Our viewers know that we're funded by the Kremlin. They watch RT with this in mind. And this is why we're getting viewers. Because if you actually turn on RT, you'll see that we cite the Ukrainian government. We cite NATO. We cite the State Department. We cite the American side. Yes, of course, we also cite the Russian perspective, and of course maybe even more so because that's the perspective that we feel is being sidelined. AMANPOUR: Anissa, you have now had a long preamble. But I didn't actually get you to answer my question and that is does one believe – do you believe that you're there specifically to counter a weight problem when it comes to the weight of information? And let me ask you specifically about the whole idea, which is one of the big issues at play inside Russia and RT’s representation of it abroad, and that is describing the nature of what's happening in Ukraine. For months and months and months now, Russians and Russian state media and Kremlin-funded media, such as yourself, have portrayed Ukraine as sort of phobic to pro-Russian separatists or minorities there as neo-Nazis, fascists who just want to abuse and assault them. And that has appeared on your channel. And President Putin has said it several times. My question obviously is what is the point of that? And let me first just play this piece of an interview from President Putin not to your channel, but he said it before to a German channel just this weekend. [TECHNICAL PROBLEMS] From President Putin, this past Sunday: "We're truly concerned that the wish to start ethnic cleansing may soon arise there." He's talking about Ukraine. "We're afraid that the Ukraine will become immersed in neo-Nazism. You can see people wearing swastikas on their sleeves and the SS insignia on the helmets of some units fighting in the Eastern Ukraine at the moment." And of course, you all remember the big – the big sort of billboards that Russian television and media put up during the Crimea referendum, equating, you know, Russia – or rather saying the choice is Russia or neo-Nazism. So I guess, Anissa, my point to you is, why go to such efforts to brand Ukraine as such, when the polling data itself says that less than two percent of the people actually voted for any kind of far right group? You know, I'm asking you because it's so important in the way people understand what's happening in Eastern Ukraine. NAOUAI: Yes, I agree it's important. I think what you're trying to say is that it's perhaps being exaggerated, the threat of neo-Nazis, which perhaps is true. I'm not Russian. The Russian people lost almost 30 million people fighting fascism during the Second World War. Who am I to say that this is a made-up threat? There's clear documentation, Christiane, which obviously you have access to, obviously your audience, our audience has access to. There are people that walk through the streets of Kiev with swastikas on. There are – there is this trend of tying in this kind of glorification of Nazism with the anti-Russian sentiment that is trying to be up in the West. And there's also, I think what Putin was referring to there was not so much the Nazi trends, but the civilians being killed, which organizations like Human Rights Watch, like Amnesty International, like your own reporter – one of my, I think, one of the most powerful reports I've seen from the East, to be quite frank, was not from Russia Today. It was from your reporter, Diana Magnay. And she's in the East. And basically it's a phenomenal report. I mean, it's horrific and it was civilians in the East calling themselves Ukrainians and saying stop killing us, Petro Poroshenko. Stop killing us. So to imply that this is not going on, that civilians are not being killed by the Ukrainian army – let's be very specific here – and this is what you have on camera. Was this report run on CNN around the clock? No! AMANPOUR:But that’s not what I was asking, Anissa. Anissa, I was asking - obviously there's a war going on and we understand there are hundreds if not thousands of people have been killed. I'm talking about the specific characterization of a policy of fascism and neo-Nazism, which your president – or rather the Russian president – and the foreign minister and other senior officials keep repeating. So let me turn to Mr. Kasyanov, who used to be prime minister there. Is there, do you believe – Anissa admitted there might be exaggeration. Is it more than exaggeration? And as such, is it a fair interpretation of what's going on and what are the consequences? NAOUAI: I didn't admit that it was an exaggeration. I said who are we to say that it’s an exaggeration as non-Russians. 30 millions of them were killed in World War II. I said, “Who are we to say it’s an exaggeration?” That’s what I said exactly. AMANPOUR: No, you didn't say that. You said they may – that might be an exaggeration, but then who are we to say that fears are exaggerated? I've got that on record. So don't worry about it. That's going to be played. AMANPOUR: All right. But you actually did and I'll play it and you can dispute it afterwards if you like. But I will play it and it's not a problem. It's what you said. Now I'm putting it to you, Mr. Kasyanov. What are the consequences of inflating these numbers? And I will say that there is a huge attempt to tar the Ukrainian government as neo-fascist when two percent, less than two percent, voted for far right groups in the last elections in May. AMANPOUR: How successful, though, has Anissa's channel been and other Kremlin-sponsored state-funded media in Russia? How successful are they? KASYANOV: All these channels, they never describe reasons why just this annexation and the war started. They prefer to describe what's going on now, there. Hundreds of people killed and just problems – other people just having problems because of the war. KASYANOV: In Russia, it’s absolutely successful. People are fooled by state propaganda. All media under full control of Mr. Putin. And this enhanced adoration by him and his team and in fact they popular social – sociological poll for 85 percent of support of Putin's policy in Ukraine, that is a result of – that's the result of this propaganda. And unfortunately, I have to admit that even educated people who understand that it's not possible to behave in 21st century in this manner Mr. Putin does, they think that annexation or just joining of Crimea to Russia is fair, because of the simple reason – all people living in Russia today, they got their information through their textbooks in schools, history that Crimea was always Russian. And they don't support Mr. Putin. But they believe Mr. Putin will disappear but Crimea will still be part of Russia. That's why that there is a such a - I wouldn’t say consensus, but popular view on what's going on in Ukraine. AMANPOUR: Anissa, can I come back to you? Because that's one issue. But another gathering fear, certainly in the West – and the Financial Times has been writing about it – is the idea that President Putin, either publicly or with certain individuals who he talks to and other powerful figures in Russia, are, quote-unquote, "putting the nuclear gun on the table now." And let me read you a few things that have been written over here. Apparently President Putin has told domestic audiences that outsiders should, quote, "not mess with us, because Russia is one of the leading nuclear powers." Does it worry you, that kind of thing? And when Russians start to talk about their nuclear arsenal, do you – does your sensibility start getting heightened? How do you decide to cover this when you have your editorial meetings? NAOUAI: Again, Russia Today airs to the West. So we have a global audience. And we cover stories that we think affect a global audience and especially with the Ukraine crisis, a lot of the mainstream narrative dictates what exactly we cover. We come to work and we see a lot of holes in the stories that you're telling your audience, holes that can be easily closed by just going online, trying to verify videos, trying to get kind of different sorts of perspectives on the air. So that helps a lot in trying to decide what we're going to cover. And I think it's careful when – you need to be careful when you start bringing these sort of nuclear threats taken out of context. This is a very serious issue. And as journalists, we need to be careful when we pick and choose what quotes we want to give to a global audience. I have to say I do not know what you're referencing specifically about this Russian – what Putin said to a Russian television. To be honest, I work a lot and I don't exactly watch the Russian media every night. RT airs to a global audience. NAOUAI: I’m not sure exactly what channel you’re referring to or what speech you're referring to. But I do know – but I want to – I want to make this clear, that I do know that Putin has made it very clear to the Russian people that he's not looking for war, but he will continue to protect Russian interests. And when you're talking about military aggression and about perspectives of Russia around the world, all you need to do is look at a map. Look at a map and look where Ukraine is and look where Russia is and look where the United States is and then look at all of the countries and bases surrounding Russia. And tell the audience again that Russia is the aggressor here. AMANPOUR: Let me ask you, because you brought up verifying video – and again it's on a state-run television, it's not RT, but it's state-run television. And let's be – let's be fair also – RT and all its other incarnations does get traction inside Russia. But anyway, Channel 1 made international headlines last week because it broadcast, quote, "sensational photographs of what it said were satellite images of a Ukrainian fighter jet shooting down Malaysia Airlines Flight MH17." As we know, what happened then, 289 people on board. Now critics immediately pointed out discrepancies in this imagery. Apparently it displayed the wrong markings for the Malaysian flight and it just was a fake image. When that happens, do you feel that it's in your realm of responsibility also to point that out? NAOUAI: Again, I have to point out that I don’t represent the Russian media, but RT. I know the image you're talking about, of course. It should be pointed out also that that image was on the Internet for quite a couple of months – unfortunately this channel took the bait. They didn't verify it. We did, of course. That's why we didn't show it. But to sort of condemn the First Channel for mistakes that we've all make – and I remember very well Jim Clancy of CNN showing a video in Donetsk in May of this year of a supposed helicopter being downed by these anti-Kiev fighters. We went online; we checked the video. The video was from Syria. We never even saw a retraction from CNN. So it's a little difficult to judge. Obviously this is a market, they were trying to perhaps have a scoop. It's a dangerous thing. It's very unfortunate that they took the bait and it's a very dangerous trend. So all I can do as a journalist is, yeah, condemn it. It was a mistake. But they're certainly not the only journalists in the world that make mistakes like that. AMANPOUR: But what's him aim? KASYANOV: - first just to strengthen his support inside Russia, to keep power. For authoritarian regime it's important always to have external enemy and quick victories. Georgia was one victory, which helped him to establish his own strengthening inside Russia. Now just Ukraine. And secondly, he, of course, wants to – the West to accept his regime as normal. AMANPOUR: And what do you think his takeaway is about Western leaders, given how they've reacted over the last, I don't know, several months? KASYANOV: That was a real shock for him. He didn't expect, first of all, transatlantic unity, which is absolute basis right now for all, I would say, just talking of normalization of all this environment, of all this situation. And secondly that European Union just taken just such unified position, together with the United States. And of course Mr. Putin spent quite a lot of efforts to have a – to divide the policy and to divide countries inside European Union. But when major European Union countries just initiated and directly supported those sanctions – sanctions I would underline, not against the Russian Federation, Russian people, but against individuals who are responsible for all just these misdeeds. And also against just instruments, which is in the hands of Mr. Putin, like state corporations and state banks. AMANPOUR: Listen, last question and then we'll say goodbye and you can get back to your work, because I know you have your show coming up. So here we go. Anissa, you told me that you're American and so I want to know from you what your thoughts are about the whole media landscape because there are less and less independent media there, certainly less and less independent television, more and more of them being shut down. I mean, even the Russian government is legislating to make it impossible for CNN and other external broadcasters to actually broadcast because of the tough terms they're putting on us. Do you think that's a good thing? Is that healthy or bad? I mean, if everything is state controlled media, is that healthy for the society or not? NAOUAI: I don't think that's a really accurate picture of what's happening. I can’t name one television station that’s been shut down, first of all. NAOUAI: What - I can't name one television station which has been shut down. I just came back from News Exchange, where we asked CNN executives why they were supposedly stopping their broadcast in Russia. And they said it was a technical glitch with the cable companies. NAOUAI: You're announcing right now that the Russian government is making it difficult to work in Russia. AMANPOUR: Alright. I'm telling you right now that there is legislation underway that makes it difficult for us to broadcast. And it's not just us. It's television all over the place. But my real question to you is: do you feel that it's healthy for a society just to get a diet of one side rather than the other? And that is what's happening. NAOUAI: I disagree that that's what's happening. Certainly at Russia Today, like I said, we always cite the Ukrainian government. We always cite Western governments, Europe. If you want to analyze internal Russian news, I'm not sure I'm the best person to do it, to be honest. But certainly, at Russia Today, we always try to show both sides of a - do we show more of a Russian perspective? Of course we do, because that's the perspective that's being sidelined. But it's an absurd question coming from someone that's propagated the line of the State Department for over 15 years. I mean, it's absolutely absurd. NAOUAI: Yes. Absolutely I'm talking to you. Who else would I be talking to? NAOUAI: You've propagated the line of the State Department for over 15 years, starting with Yugoslavia and all the way into Syria. And now you're doing it for Ukraine, essentially. Absolutely, I’m talking to you. NAOUAI: I've seen lots of your reports and in not one report where you find you questioning the United States government and their policy. And we, with our Russian propaganda, question those arms to the FSA, question those arms to al-Nusra and other leagues. And now today we have ISIS. AMANPOUR: Anissa, I'm really now - listen, I invited you on this program - I invited you on this program to have an adult discussion. NAOUAI:How dare someone come on CNN and say that! 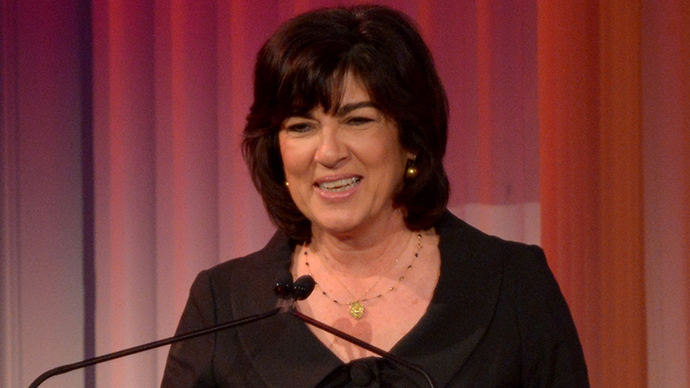 AMANPOUR: No! Hey, excuse me, no, no, no, you just said whatever you wanted to say. When you become ad hominem to me, that's a problem, because you're not doing it from a basis of knowledge. NAOUAI:Well, let your viewers decide, Christiane. I think that's the fairest way out of this debate. AMANPOUR: You're doing it - I don't know why you're doing it. But you're not doing it from a basis of knowledge. NAOUAI: Let your viewers decide. Let them go back to your work in Yugoslavia and see if it doesn't fall exactly in line with the State Department’s line. AMANPOUR: I tell you what. You just go and see the interview with President Clinton and then you'll be able to choose, because you can be sure I'm not putting this on the air, Anissa. It's a personal attack. NAOUAI:I don’t know what Bill Clinton wanted. I'm talking about your work as a journalist. AMANPOUR: Anissa, come on; you've lost me, babe. Thank you very much. Thank you very much indeed. I really appreciate it. I'm sorry; I thought we could have an adult discussion. And we can't. Thank you so much. Alright. Now I have to pretend to thank you.